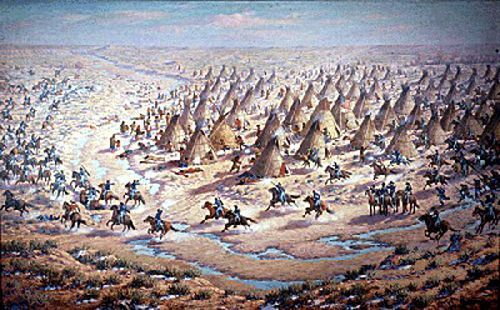 Painting of the attack on Sand Creek, by Robert Lindneaux, 1936. Fort Morgan (1864-1868) – This post was established in 1864 to protect the mail service and immigrants along the Overland Trail. 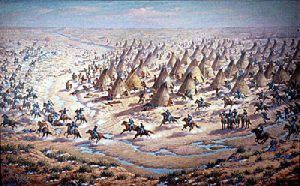 During this time, the Cheyenne and Arapaho Indians were committing a number of raids in the area in response to white settlers encroaching upon their hunting grounds and in revenge for the Sand Creek Massacre. Located on a plateau called “Morgan Flats” about ½ mile from the South Platte River, the site was chosen for its commanding view of the entire river valley. Initially, construction of the post began by Colorado Volunteers under the leadership of General Sam Brown and was first called Camp Tyler. The really heavy work, however, was completed by “Galvanized Yankees” under the command of a Captain Williams. These troops were Confederate soldiers released from prison under the condition that they join the union army and move west to fight the Indians. At that time, the post’s name was changed to Camp Wardwell. When the fort buildings were complete, a detachment of Federal soldiers from the Missouri Cavalry under Lieutenant Colonel Willard Smith were garrisoned at the post, which was finally christened “Fort Morgan” in honor of Colonel Christopher A. Morgan. The post was about the size of one square city block and included about 20 sod and adobe buildings surrounding a parade ground. Staffed with up to 1,200 soldiers, it was the only army presence between Julesburg, Colorado to the east and the populated regions of the Rocky Mountains to the west, it was the largest organized armed presence for miles. Immediately, the presence of the troops acted as a deterrent to the Indian raids in the area and offered protection to travelers along the “Fort Morgan Cut Off” of the Overland Trail. 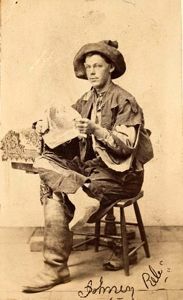 Within just a few short years, the Union Pacific Railroad completed its line from North Platte, Nebraska to Cheyenne, Wyoming, and most of the Indian raids had been subdued. In 1868, the troops were moved to Fort Laramie, Wyoming and the fort was decommissioned. The buildings were then sold at auction. Today, there are no remains of the fort. The site is located in the city of Fort Morgan at approximately the same location as a Municipal Skate Park and Tennis Courts on Railroad Avenue.